The helix is an excellent form for economical construction of biological structures. Frequently, many copies of a single protein assemble to form a long filamentous structure, requiring only a single gene product. Another strategy includes the addition of minor proteins with specific functions as, for example, the specialized binding protein found at the tip of bacterial adhesion pili (left). Each bacterial strain expresses pili specific for enhancing survival in their local environmental niche. 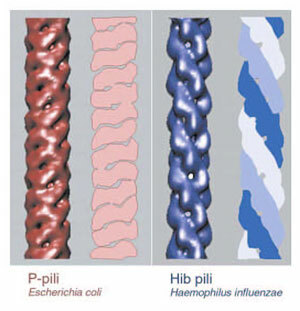 Bacterial adhesion pili are composed of helical filaments, with ~1000 copies of the major pilin, plus one or a few copies of ~5 minor pilins. The minor proteins provide binding specificity, membrane anchoring, and adapter functions. In muscle fibers, “thin filaments” composed of the protein actin and its regulatory proteins, interact with “thick filaments” composed of the protein myosin. Surface views of cryo-reconstructions of thin filaments showing the positions of tropomyosin strands on actin (gold) in (a) the absence and (b) presence of Ca2+. In (c) tropomyosin strands associated with both positions are superimposed on actin for comparison. In the absence of Ca2+(B-state), tropomyosin (red) occupies a position on the inner edge of the outer domain of actin, whereas in Ca2+(C-state), tropomyosin (green) lies along the outer edge of the inner domain as found for negatively stained filaments. 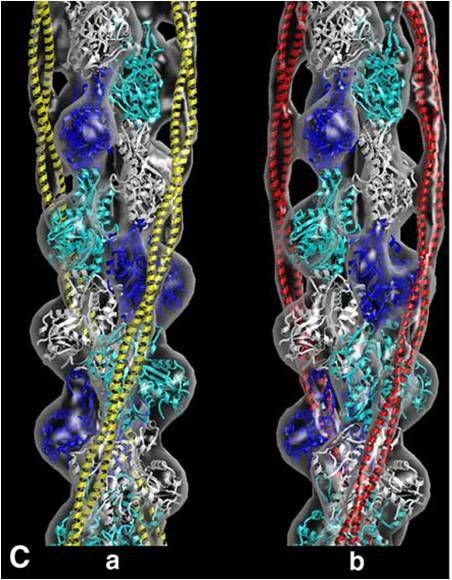 Both of these helices, which have been opened up and viewed from the outside, have the same helical symmetry, 23 subunits in 7 turns. The appearance is very different, due to the shape of the individual subunits (stars versus saucers), strengthening the 3-start helix (pink) in the stars helix or the 1-start helix (yellow) in the saucers helix. 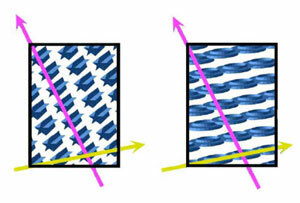 These two helices will have the same layerlines in a computed Fourier transform, but the intensities along those layerlines will reflect the difference in subunit shape. Congratulations to Mehraj Awal and Angela Urdaneta! Photos from P&B Pi(e) Day 2019!